During my visit to the Palouse area of Washington State, I spent a lot of time driving around looking for stuff to photograph. There is one photographer who sells a map — it has all the barns, grain silos, good views, etc, marked on it. You may be surprised to find out that Google Street View isn’t available on many of the roads in the Palouse, so having a map actually helps quite a bit. I didn’t visit everything on the map, but I did use it to find a few things, plus it had all the country roads on it. I was up before sunrise trying to get a few shots of the setting moon, and when I was done, I decided to keep looking for things to take photos of. Pulling out the map, I saw that nothing was noted in the area that I was in. Not wanting to lose the good light, I took the next gravel road I found, and headed west. Just a couple miles down the road, there was a great looking barn. The sun was coming up behind me, lighting up the hills and barn in front of me. I took a few photos of this barn, and I like them very much. I’m glad I took the time to explore this road. 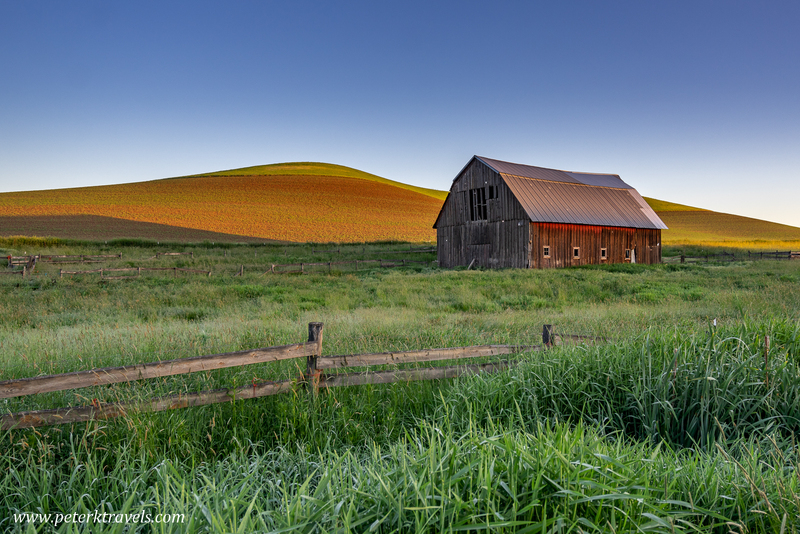 Barn at Dawn, the Palouse.